The CH7317B is a Display Controller device interfaces seamlessly to HDTV or PC monitors that is equipped with a VGA RGB interface display connector. Its input port, complied with Intel SDVO Specification 1.2, can accept a digital graphics, high-speed, AC-coupled, serial-differential RGB input signal, and convert it to analog RGB signal for driving the display. The CH7317B supports maximum pixel rate of 165MP/s and is capable of displaying up to 1920x1200 resolution with reduced blanking. 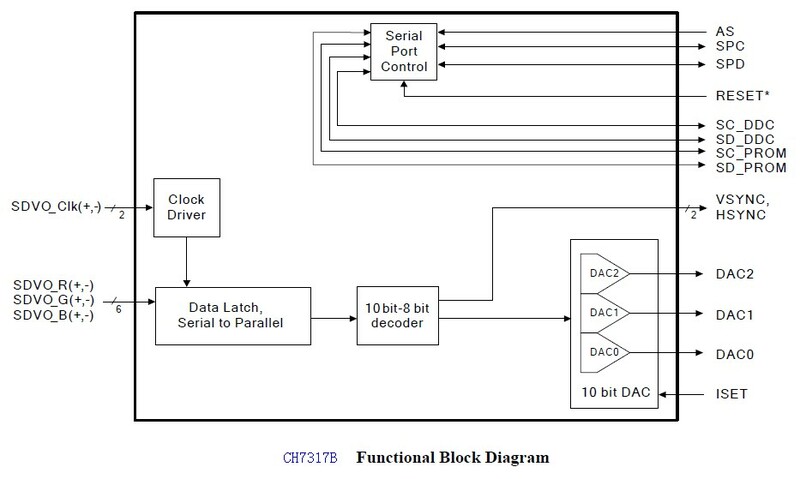 The built-in serial port controller will allow the graphics chipset to obtain the monitor’s EDID information or communicate with CH7317B internal registers through SDVO Opcodes. In addition, the transmitter is designed with a monitor connection detection algorithm that allows the graphics chipset to read back the connection status through CH7317B internal registers. The CH7317B provides the Boundary-scan test to help system developers to check the interconnection between chip I/O and the printed circuit board for faults. When the device is powered down by the graphics chipset, its current consumption is less than 100uA. The CH7317B is available in 64-pin LQFP and 64-pin QFN packages.